On August 31, 1939, nearing the end of his second and presumably final term in office, President Franklin Delano Roosevelt was working in the Oval Office and contemplating construction of his presidential library and planning retirement. The next day German tanks had crossed the Polish border; Britain and France had declared war. Overnight the world had changed, and FDR found himself being forced to consider a dramatically different set of circumstances. 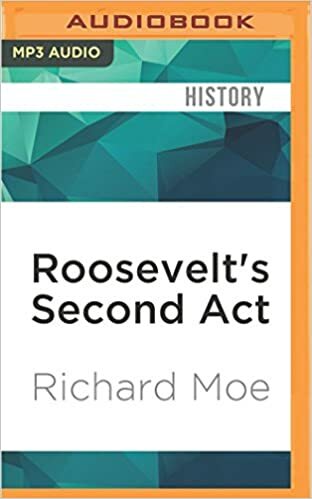 In Roosevelt's Second Act, Richard Moe focuses on a turning point in American political history: FDR's decision to seek a third term. Often overlooked between the passage and implementation of the New Deal and the bombing of Pearl Harbor, that decision was far from inevitable. As the election loomed, he refused to comment, confiding in no one, scrambling the politics of his own party; but after the Republicans surprisingly nominated Wendell Willkie in July 1940, FDR became convinced that no other Democrat could both maintain the legitimacy of the New Deal and mobilize the nation for war. With Hitler on the verge of conquering Europe, Roosevelt, still hedging, began to maneuver his way to the center of the political stage. Moe offers a brilliant depiction of the duality that was FDR: The bold, perceptive, prescient and moral statesman who set lofty and principled goals, and the sometimes cautious, ambitious, arrogant and manipulative politician in pursuit of them. Immersive, insightful and written with an inside understanding of the presidency, this book challenges and illuminates our understanding of FDR and this pivotal moment in American history.